SUVs don’t typically perform all that well in the “moose test,” but the Tesla Model X isn’t your typical SUV. For comparative purposes, the 2014 Jeep Grand Cherokee performed the “moose test” at speeds as high as 44.1 mph, so the speed of the X isn’t exactly brag worthy. Here’s a link to massive list of moose test results. 7 Comments on "Tesla Model X Performs The Moose Test – Video"
Sadly, I fear an actual moose accident will be horrible due to the long windshield, which offers no protection. There’s nothing special about the angle. The moose will go straight through the glass. 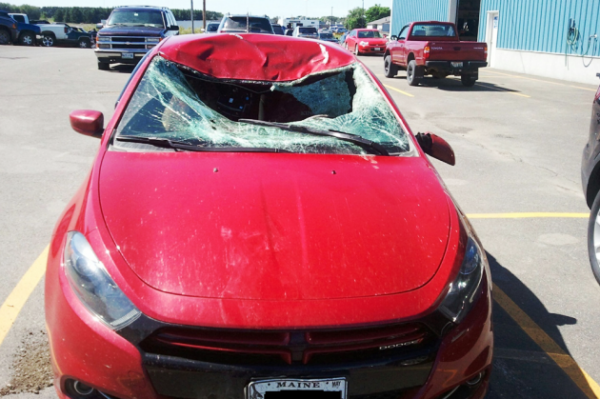 If you look at pics of crashes, the top of the roof is the only thing taking the impact and on the X by that point the moose is already in the car. Other reasons it may have performed well, is the larger diameter wheels allow less tire sidewall flex and the wide rubber allows more road surface contact. Disappointing that the X couldn’t out-perform the Grand Cherokee on this test. I thought the battery in the floor weight would have helped it do better. Of course the extra weight is an impediment when trying to change direction, which probably explains the result.